Those fighting plans to make London's congestion charge zone bigger say £166m will be wasted on outdated technology. Cameras have been installed around the western extension area which will be covered by the charge from February. The West London Residents' Association has said they will quickly be outdated and replaced with the cheaper "tag and beacon" system within two years. Transport for London said that while it is trialling the new system, there are no firm plans to replace the cameras. With "tag and beacon", cars have a tag on their windscreen, which registers radio signals when it passes a roadside beacon, paying the charge automatically. Currently TfL use automatic number plate recognition (ANPR) technology inside the zone, which drivers pay £8 a day to enter. Gordon Taylor, chairman of the WLRA, told BBC News the indications were the system would be installed by 2009, when Capita's contract for operating the system comes up for renewal. He said: "The cost of running the camera system is nearly 50 times that of the tag and beacon system in Singapore, which is dealing with more or less the same number of vehicles. "There's no way they will not use tag and beacon, it's a proven technology - they are putting in cameras which aren't right for using tag and beacon, the whole system will have to be rewired and re-installed." 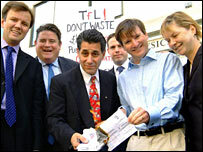 Protesters, including Hammersmith and Fulham MP Greg Hands and London Assembly Conservative member Angie Bray, destroyed a fake cheque for £166m outside a conference on Congestion Management in Portland Place on Wednesday. But a Transport for London spokesman said that while there was a "mini trial", running in Southwark, south London and due to end this summer, there were no definite plans to introduce tag and beacon. "The trial is due to end at the end of summer, we will have a look at the results then," he said. He added that the areas covered by the new charge zone - including Bayswater, Notting Hill, Kensington, Chelsea, Knightsbridge - were among the most congested in London - something disputed by the WLRA. TfL has argued that any new system would still need cameras for enforcement, so any investment would be "complementary" to them.